The Agents, a self-published game designed by Saar Shai, will reportedly be comprised of 36 Agent cards, 20 Mission cards, and 32 Point cards. As this is a prototype of the game, we will not comment on the game component quality. We will state that the game’s artist, Dan Morison, is an incredible talent. He has captured a gritty world full of eccentric and dangerous characters perfectly. 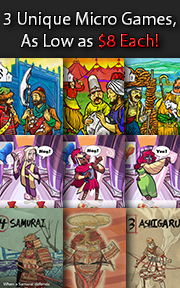 Each card in the game is pure eyecandy and DEMANDS the cards be sleeved so as to avoid accidentally damaging the illustrations through vigorous game play. Just look at this awesomeness!!!! To set up the game, separate the cards by type into different decks, shuffling the Agent and the Mission decks once they are separated. There should be 4 card decks in total once completed: the Agent deck, the Mission deck, the 1/2 Point deck, and the 5/10 Point deck. Second, place the Agent and the Mission decks in a row in the center of the game playing area face-down, leaving room for a discard pile for each deck. Organize the Point decks so that the same numbers are all facing the same way. Place the 1/2 Point deck so that the “2” value is face-down and the 5/10 Point deck with the “10” value face-down in the same row as the previously placed decks. Third, each player draws 3 Agent cards, 1 Mission card, and 1 “5” value Point card. The Point card is placed to the player’s right with the “5” point value face-up (the current value of a Point card is always face-up in the game). This is the start to the player’s Point pile where all their Point cards will be placed. 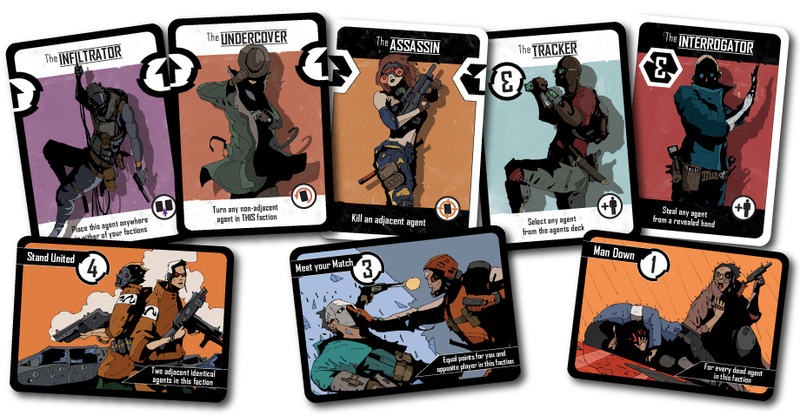 The Mission and Agent cards create the player’s starting hand. The Agents is played in turns with no set number of turns or rounds per game. On a player’s turn, they must take 2 actions. There are a total of 6 different action types for the player to choose from, including a free action type that does not take an action to innate. The available action types are summarized here. Note that if the Agent or the Mission decks are ever exhausted, their respective discard piles are reshuffled to create a new draw deck. There are two sub-types of Agent cards in the game. The first are “Faction” Agents which are the most common. The second are “Free” Agents. For one action, the player can play either sub-type. “Faction” Agents are played to either end of a Faction row. A Faction does not belong to any one player during the game. The number of possible Factions on the table is dependent on the number of players in the game. Two Factions for a 2-player game, three Factions for a 3-player game, four Factions for a 4-player game, 5 Factions for a 5-player game, and six Factions for a 6-player game. When playing a “Faction” Agent, the player can only play to the Faction row that is to their right or to their left. In this way, Factions are always “between” players (both figuratively and literally speaking). Thematically, the players are the “big bosses” pulling the strings of the Factions between them in a virtual game of Tug-o-War. When playing a “Faction” Agent, the player must decide if they want to use it for Points or for the Command ability. Not both. Whichever of the two the player does not take will become available to their opponent (recall that 2 player’s share the same Faction). The Command ability allows the player to take a special action that is beyond the normal game rules and it MUST be taken if possible. For example, the “Infiltrator” allows a player to place the card anywhere in a Faction row and then use the Command ability of the adjacent “Faction” Agent to its left or right, but only if the Command of the “Infiltrator” and the adjacent “Faction” Agent are facing the player! The other end of the “Faction” Agent card is an Arrow Half. When two halves join, they will either make a full black arrow on a white field, a white arrow on a black field, or a split between the two. These count as points and they are awarded to the player the arrows are pointing to. The appropriate Point card is collected by the player and added to their Point pool. Both the Command ability and the Points are resolved before the next action or turn can take place, with the Command ability being completed first. “Free” Agents are not played to a Faction (they are independent thinkers). Instead, they are played between their owning player and any opponent in the game. This allows a player to interact and mess with their opponents they could not otherwise get to. Like a “Faction” Agent, a “Free” Agent either provides Points or a Command ability to a player. Not both. Unlike a “Faction” Agent, the “Free” Agent CANNOT be played unless the Command ability can be completed by the player it’s pointing to. In this way, a player can force their opponent to take an action they might not have otherwise wanted to complete. Both the Command ability and the Points are resolved before the next action or turn can take place, with the Command ability being completed first. Once completed, the “Free” Agent is placed in the Agent discard pile. An Agent’s Command ability might include the following keywords. Those keywords and their meaning are summarized here. “Kill” means to select 1 “Faction” Agent and flip it so it’s face-down in the Faction row. A dead “Faction” Agent cannot be killed again or turned. They can be extracted, swapped, and always count as an “adjacent” Agent, as well as being counted as part of the total number of “Faction” Agents in a Faction row. “Extract” means to pick up 1 “Faction” Agent from a Faction row and place it into the player’s hand. Any gaps created in the Faction row are closed by moving the “Faction” Agents together. Points are not earned from any newly matched Arrow Halves. “Turn” means to rotate 1 “Faction” Agent so that the opposite end is now facing the player, but its original position in the Faction row remains the same. Points are not earned from any newly matched Arrow Halves. “Swap” means to change the position of 2 “Faction” Agents in a Faction row. Orientation of the “Faction” Agents must remain the same. Points are not earned from any newly matched Arrow Halves. For 1 action, the player can activate the Command ability of a previously played agent, but only if the Command ability is facing them. Points are not collected again by the player’s opponent if the “Faction” Agent being used for the Command ability has matching arrows. For 1 action and Points, the player can add Agent cards to their hand. For 1 Point, the player can take the top Agent card from the Agent deck or for 2 Points the player can take the top most Agent card on the Agent discard pile. For 1 action and Points, the player can add Mission cards to their hand. For 3 Points, the player can take the top Mission card from the Mission deck or for 4 Points the player can take the top most Mission card on the Mission discard pile. For free (no action is spent), the player can remove a previously played Mission card on the Faction row to their left or right that they own and add it back to their hand or play a Mission card to a Faction row to their left or right. These Mission cards belong to the player, not to their opponents who sit on the other side of the Faction row. Missions are considered always “on” and define a certain condition or action that must take place in the Faction row they are assigned. If the condition or action takes place, the Mission card awards their owning player, unless stated otherwise on the Mission card. A maximum of 2 Mission cards can be placed on any one side of a Faction row and no two of the same Mission can be assigned to the same Faction. For 1 action, the player can switch a previously played Mission card to a Faction to the player’s left or right with a Mission card from the player’s hand or from the top Mission card from the Mission deck. The previously played Mission card is then discarded in the Mission discard pile. The player then draws 1 Mission card and adds it to their hand. Once the player has taken 2 actions, their turn is over and the next player in turn order sequence (going clockwise) now goes. Points in the game are both currency and means to victory. A player must decide if they hoard the points they have earned through Agents or completed Missions to count towards a possible win or use them to further strengthen their Factions. Without spending Points, a player’s options are exceptionally limited. Then again, if a player spends too many Points, they’ll never win the game. When buying Agents or Missions, the player returns the Point cards used to their appropriate Point deck. “Change” can be made by flipping over owned Point cards to a lesser value or by swapping out a higher Point valued card with a lower Point valued card from the Point decks. Remember that the current value of the Point card is always face-up. Point cards come in number values of “1”, “2”, “5” and “10”. The game continues as noted above until a player has collected 40 or more points. This player is the winner and has repaid all those who have wronged them with extreme prejudice. The Agents, just based on the rules, appears to be an exceedingly complicated game to win. Not because the game rules are complicated, but because of the high level of planning, trading, swapping, moving, and shuffling of Agent and Mission cards that will be necessary to score Points. The game would appear to have a lot of depth, will demand strategy, and will make plenty of use of tactical card plays. In other words, I think the game will be a mixed bag for the Child and Parent Geeks, but should make the Gamer Geeks go goo-goo with delight. The Agents does not appear to be a casual game and will demand a lot of brain power. Games like this tend to burnout the young minds of the Child Geeks and be more work than the Parent Geeks want to put into a game due to their lack of available time. There is also the depicted violence that must be considered. While not overly gory, violence is portrayed in the cards. 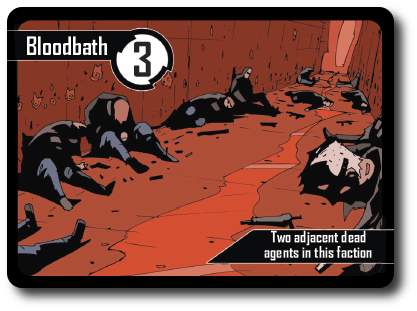 Take the “Bloodbath” Mission card (shown above) as an example. You don’t see violence taking place, but you get an eyeful of the results of the violence. Bullet holes, dead bodies, and a gutter full of blood. That won’t be of any concern to a Gamer Geek, but some of the Parent Geeks might not approve of it and avoid introducing the game to their Child Geeks. Personally, I think my oldest little geek can handle it. The illustrations on the cards are somewhat like one of his (and mine) favorite comic book illustrators, Mike Mignola (of Hellboy and B.P.R.D fame). I’ll leave it up to the other Parent Geeks to decide what is best for their Child Geeks. Teaching The Agents is not complicated, but you must be precise in your explanations. The cards in the game shift around a lot and their position and location are very important. For traditional card players, playing on opponents’ runs and sets is not that uncommon. For inexperienced players, sharing cards on the table is a very foreign concept and one that had some of our players a bit confused. I suggest you focus on the “Faction” Agents and the Faction rows first, explain how the cards are used and who owns what. Then introduce the Mission and the “Free” Agents. After several attempts, this was found to be the easiest way to explain the game in a way that all the players understood. Again, the game is not complicated, but requires careful explanation from the very start or the players are going to be lost. After explaining the game to my 8-year-old, whom I am most pleased understood how the game was played after only about 10 minutes of game explanation and examples, we were ready to go head-to-head. Before we started, I asked him his thoughts on the game so far. My little geek raises an excellent point. The Command abilities are a bit difficult to comprehend until you get the Agent on the table. So much depends on a card’s position that any Command ability is essentially useless until the Faction rows start to take shape on the gaming table. Let’s play the game and see if The Agents provides a fun challenge or we should put it out of its misery. The Child Geeks were very mixed when it came to their final endorsement of the game. For the older Child Geeks and those Child Geeks who were allowed to play the game, they found The Agents to be a real challenge. What we observed were Child Geeks scratching their heads as they were perpetually locked in analysis paralysis. The Agents doesn’t give its players any hints or suggestions on what to do next. It’s all just put in front of the player and the rest is left to them. The Child Geeks struggled with this. Without clear signposts or guides, they had a hard time finding their feet and making progress. Points were earned, but slowly. 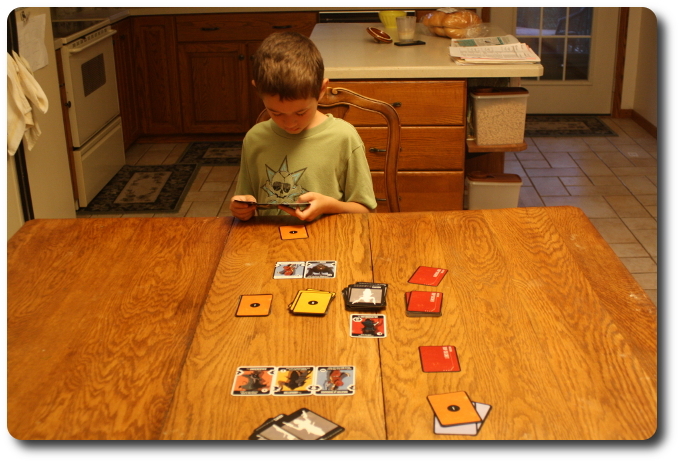 The older Child Geeks were able to grasped the game’s complexity and intent about midway through and demonstrated a quick regrouping that showed they were starting to formulate strategies and tactics. The younger Child Geeks did not. My 8-year-old, who has had a lot of game playing experience, was able to get his game playing in order about mid way through. It was only after several games that he felt confident and much less exasperated. The end result for all the Child Geeks was a mixed vote of approval and pleas to play an easier game. The Parent Geeks were also mixed. The gamer Parent Geeks grasped the game’s concept and game play very quickly, using some very interesting tactics and strategies early during their games. The non-gamers, even those who played a great number of complex and involved traditional cards games, were much slower. According to one of the non-gamer Parent Geeks, “I understand how to play, but I can’t seem to get the game to do what I want it to do.” Specifically, the Parent Geek was talking about their in ability to generate Points. Some of the Parent Geeks struggled with the choice of using the Command ability or the Point values. The way it often played out is that a Parent Geek would favor one over the other initially and then shift to using just the other. Eventually, all the Parent Geeks found that perfect balance between the two and the game play quickly sped up as a result. In the end, the Parent Geeks were split on their final endorsement. The gamer Parent Geeks both approved and rejected the game, depending on their personal preference or avoidance to games that were a bit more involved than “casual”. The non-gamer Parent Geeks all voted to reject it. According to one Parent Geek who I thought summed it up perfectly for their peer group, “This is not an easy game. You have to really think things through, watch the Factions, and make some difficult choices. I often felt like I was crawling uphill and never got to a point where I believed I was making solid progress. Of course, it made me feel good to know that my opponents felt the same way!” The end result was a mixed endorsement from the Parent Geeks. 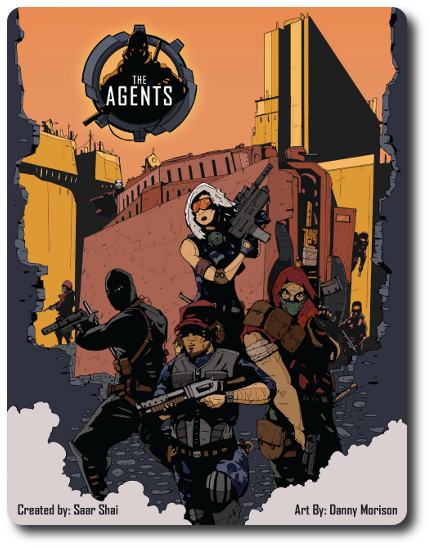 The Gamer Geeks loved The Agents, finding it to be a card game with a great deal of depth, strategy, and tactical card plays. There is a lot to consider and a player must have one eye firmly focused on the current Factions and the other on their opponents’ points. According to one Gamer Geek, “This is the kind of card game I would sit down and play anytime. It’s got a lot of character, makes me work, and it feels very rewarding.” All the Gamer Geeks quickly grasped the game’s complicated game play, found lethal card play combos, and were clearly being challenged. Which is to say, they were very quiet at the gaming table. Gamer Geeks who socialize a lot are clearly not overly concerned about their chances of winning the game. A table of quiet Gamer Geeks means they are and most likely are feeling a bit stressed as a result. Which, oddly enough, they like. And The Agents certainly did challenge them. When it came time to give their final vote, all the Gamer Geeks approved the card game and were ready to play it again. Jeepers…where to begin. The Agents is a difficult game to describe. It’s like trying to explain how it feels to ride on a rollercoaster to an individual who has never even seen one. Your explanation will always fall well short of the actual experience. There is so much under the covers in this game that it can only be truly understood as it subtly reveals itself whilst being played. Even then you’ll still be surprised. For example, when playing cards to Factions, you are not only giving yourself more options, but also your opponent. And when an opponent kills a “Faction” Agent, you’ll spend the next round wondering why they removed a very useful card from the game they could use. You’ll then start to doubt your opponent’s ability to play the game, and before you know it, you’ve underestimated them. And you’ll never see it coming. When playing, you will be sharing two common pools of possible actions and plays with no more than 1 other opponent. You must out think and outwit your opponents by using that which is freely available and visible. But at the same time, you must do it in a way that does not draw attention to yourself. Once your opponents lock their eyes on you, it’s very difficult to move forwards. 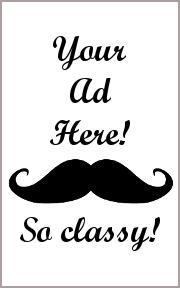 Play Mission cards too soon and you’ll be advertising your intentions. Keep hoarding cards, and your opponents will know you are up to something. The trick is finding that perfect balance so you fly under the radar. Show just enough to satisfy an observer’s curiosity, and keep hidden your true intentions at all times. It’s the game within the game, and it’s very tricky. The Agents is going to teach you two things – patience and humility. You can learn how to play it in less than 15 minutes, but you’ll spend several games feeling like you learned nothing. Victory is never assured and the fact that you have to spend your hard-earned points to buy fickle agents is often painful but unavoidable. I was caught up several times in decisions that left me feeling slightly frustrated and a bit stressed. Which, truthfully speaking, was very cool. I enjoy casual games and very complex games. What makes The Agents such a joy for me is how small it is and yet how very large and complex it feels when playing it. But keep in mind we are not talking about a lot of cards on the table here. The game is very tidy and vast at the same time. As a writer, I find it somewhat ironic that I am having difficulty putting into words how the game plays and feels. I could use words like “unique” and “rewarding”, but these do not do the game justice. The game designer has created a very interesting and engaging game that grabbed me by the nose and hasn’t let go. I’ve spent a great deal of time thinking about the game both at the table and away from the table. In the end, I think that is the most telling aspect of The Agents, and the best way to describe it to someone. This is a game that will make you think, will challenge you, and will leave you wondering what you could have done differently long after the game is over and put away. Simply excellent. I am unable to award The Agents the Father Geek Seal of Approval because of the other gaming groups’ endorsements, but the game gets two very enthusiastic thumbs-up from me! Tagged Gamer Geek Approved, Prepublished Games, Spies/Secret Agents. Bookmark the permalink.